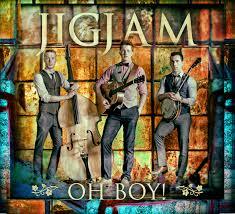 The European Bluegrass Blog: CD Review: JigJam - Oh Boy! CD Review: JigJam - Oh Boy! JIGJAM are three excellent musicians from Ireland who have put together a remarkable mixture of music and song on this this debut album “Oh Boy”. The variety is such that your musical taste-buds are refreshed as you go from track to track. The opening song “Tickle me Pink” from Johnny Flynn is reminiscent of the Punch Brothers but then you go to the second track “Levi” which starts with really good vocal harmonies and takes you on a journey from the Blue Ridge Mountains to the battlefields of a foreign land. Instrumentally they bridge the gap between pure bluegrass with a medley of “Big Sandy River”, “Groundspeed” and “Bugle Call Rag” and then a couple of tracks later there is a medley of Irish hornpipes and Reels, but even then they get a bit bluegrassy towards the end. My favourite track is “Beeswing” a Richard Thompson song that they give due justice to, especially with the added fiddle of Ciara McKeogh. Labels: CD review, JigJam, Oh Boy! BLUEGRASS EUROPE #96 out now!